Here’s an interesting and thought-provoking essay written by our most-talented and long-time designer, Joshua Swanbeck for creative blog, Design Assembly. Beth Moon’s work is on view at the ICA in the exhibition Exposed: Today’s Photography/Yesterday’s Technology thru Sept 19, 2010. The wondrous plants depicted in Beth Moon’s series The Savage Garden represent a botanical variety that blurs the line between the vegetable and animal kingdom. In addition to sunlight and water, these plants require a diet high in protein. Their seductive beauty attracts their food – insects, worms, tadpoles, lizards and small rats. For instance, the transparent hood of the Cobra Lily is designed to retain and reflect light specifically to draw the attention of an insect. Tiny hairs in the Venus Fly Trap signal when a visitor enters the claw-like appendage, which will then snap shut, paralyzing and crushing the victim. Luring prey with an intoxicating scent, the external hairs of a Pitcher plant grow at an upward angle leading insects toward the top of a slippery lip where they fall like drunks and drown inside the trap. Moon employs an equally seductive photographic process to depict these deceptively beautiful plants – a platinum printing technique that produces tones ranging from cool blacks to richer browns than can be obtained with traditional platinum printing methods. It requires no development. The process for making platinum prints was invented in 1873 and was popular until the 1920s when the price of platinum became prohibitively expensive. It was replaced by the somewhat cheaper palladium print, which employs a compound of the metal palladium rather than platinum. Both processes were valued for their great range of subtle tonal variations, which Moon has used so effectively in this series. Beth Moon was born in Neenah, Wisconsin. Although she was a fine art major at the University of Wisconsin, she is a self-taught photographer. Her interest in photography was discovered somewhat indirectly while designing women’s clothes. Moon hired photographers to document her new designs, but quickly decided to do it herself. She later sold the design company and continued to pursue her interest in photography, experimenting with various printing methods. She currently lives and works in the San Francisco Bay Area. Kerik Kouklis’ work is on view at the ICA in the exhibition Exposed: Today’s Photography/Yesterday’s Technology thru Sept 19, 2010. For the last few years, Kerik Kouklis has made tintypes of his daughter and her friends when they visit from college. Kouklis revels in the slowed-down pace of making tintypes in his studio. Unlike shooting with a digital camera, exposure time ranges from five seconds to thirty seconds, which dramatically heightens the relationship between the camera, the portrait sitter and the photographer. Also, like a Polaroid, the tintype is a one-of-a-kind photo, and the image is developed immediately after being taken. In this series, Kouklis asked each person to choose how they wanted to be photographed. After a day of shooting and developing the portraits together, they decided their images resembled a group of misfit superheroes and declared the series the Santa Cruz Saints. A California-native, Kouklis has been teaching workshops in 19th-century processes for over ten years. 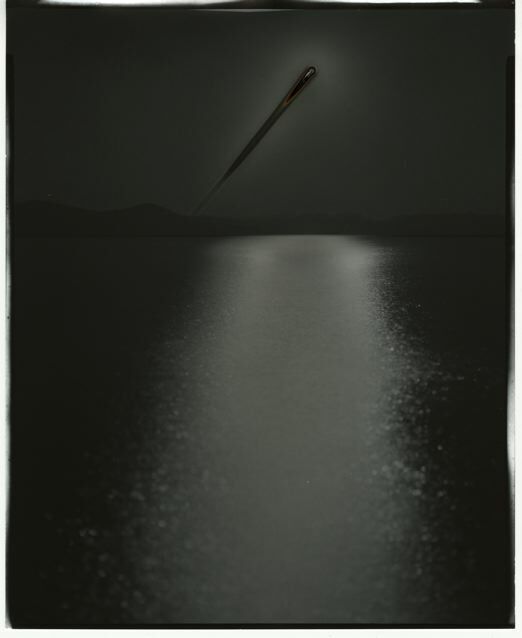 His work has been exhibited in galleries in San Francisco, Los Angeles, Gualala and Yosemite and is in the collections of the Museum of Fine Art, Houston, and the Hoyt Institute of Fine Arts, Newcastle, PA.
Chris McCaw’s work is on view at the ICA in the exhibition Exposed: Today’s Photography/Yesterday’s Technology thru Sept 19, 2010. The title of Chris McCaw’s Sunburn Series is entirely literal. Setting up for long exposures in the Mojave Desert or by the San Francisco Bay, McCaw employs the most basic elements of the photographic medium: camera, lens and paper. He then lets his open lens work as a magnifying glass to focus the sun’s light onto paper negatives. The resulting images document a landscape transformed by long exposures of the sun traversing the sky, scorching and often burning its path completely through the photographic paper. Paradoxically, the intense daytime images read as nightscapes. Chris McCaw received his BFA in photography from the Academy of Art, San Francisco in 1995 and studied photographic arts and film production at DeAnza College in the early ‘90s. His work has been exhibited throughout the United States and Europe and is in numerous public collections including SFMOMA, the Metropolitan Museum of Art, New York, the Victoria and Albert Museum, London, the Philadelphia Museum of Art and the Princeton University Art Museum. He has received numerous awards, including an Alternative Exposure Grant from the Andy Warhol Foundation for the Visual Arts. McCaw currently lives and works in San Francisco.